Jalam malayalam movie directed by M Padmakumar featuring Priyanka Nair and Jain in lead has started rolling at Aluva. Scripted by T Suresh Kumar, the movie is based on a true story on the life of Usha and Jomon, a family who live underneath the Thazhathangadi Bridge at Kottayam. It is the heart touching story of a family who makes living with dreams to have a shelter of their own. 'Jalam' will be jointly produced by M Padmakumar and T A Andrews. M. Padmakumar who is known for his majestic projects including 'Vasthavam', 'Shikar', is gearing up to venture into a new movie which tells a touching story of a family. 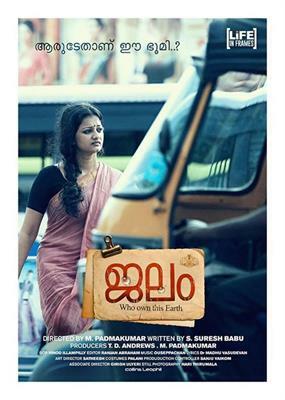 Titled 'Jalam', the movie is based on a true story of the life of Usha and Jomon, a family who live underneath the Thazhathangadi Bridge at Kottayam. Jomon and Usha live in a tented home along with two children under the bridge. As both are not having land, they make their living with dreams to have a shelter of their own. As Jomon is not having a regular job, it's too difficult to find daily bread for the family. The pathetic life of the family was reported earlier by print and visual media. But though people including the politicians gave word to rehabilitate the family, nothing was done to bring a change into their pitiful condition. Padmakumar who come to know about the situation decided to zoom the life of the family onto big screen. 'Jalam' will be jointly produced by M Padmakumar and T A Andrews. The switch on of the movie was done Jomon and Usha. Priyanka Nair and Jain will enact as Usha and Jomon on screen for the movie scripted by T Suresh Kumar. 'Jalam' will be shoot exclusively at Aluva and nearby places. The camera is being handled by Vinod Illampally while the music is set by Ouseppachan. The movie will also mark the comeback of young actress Priyanka Nair who has given life to many interesting characters. She was last seen in 'Ivide Swargamanu'. Priyanka who debuted in Vasanthabalan's 'Veyil' rose to popularity for her acting brilliance in T C Chandran's Vilapangalkkappuram'. For her exceptional performance, Priyanka earned the Kerala State Film Award for Best Actress. Moviegoers who are much aware about acting excellence of the actress is looking forward to see her in the movie 'Jalam'. M. Padmakumar's last outing in malayalam was 'Polytechnic' featuring Kunchacko Boban and Aju Varghese in lead.